A cyclops (play /ˈsaɪklɒps/; Greek: Κύκλωψ, Kuklōps; plural cyclopes /saɪˈkloʊpiːz/; Greek: Κύκλωπες, Kuklōpes), in Greek mythology and later Roman mythology, was a member of a primordial race of giants, each with a single eye in the middle of his forehead. The name is widely thought to mean "circle-eyed". Nah, just being blind in one eye don't count Sandy Duncan doesn't have a glass eye (like Sammy Davis Jr & Peter Falk did). In 1971 she "underwent surgery on her left eye to remove a benign tumor. As a result, she lost vision in the eye. (It was not replaced with a prosthetic eye, as some urban myths claim.)" "Should NEWS Programs (Broadcast News, Cable News, Websites, Radio) be punished for telling intentional lies?" For me, the greatest one eyed character of all time is the eye on top of the pyramid of the American dollar bill. Its not surprising that this is the masons or Illuminists favorite symbol as we see it everywhere, knowing that it represents Lucifer, the god they trust as it says. What the eye on the forehead of the Cyclops really represents is the third eye of the mind and soul, the eye, or eyes that the Serpent promised Adam and Eve would be opened if they ate of the fruit of the tree of knowledge, knowing good and evil and becoming as gods, the first lie ever sold. Now we have one eyed alien like mascots for the London ZION Olympics. "The Masonic religion should be, by all of us initiates of the high degrees, maintained in the purity of the Luciferian doctrine. . . Yes, Lucifer is God, and unfortunately Adonay (Jesus) is also God. For the eternal law is that there is no light without shade, no beauty without ugliness, no white without black, for the absolute can only exist as two Gods: darkness being necessary to light to serve as its foil as the pedestal is necessary to the statue, and the brake to the locomotive. . ."The doctrine of Satanism is a heresy; and the true and pure philosophic religion is the belief in Lucifer, the equal of Adonay (Jesus); but Lucifer, God of Light and God of Good, is struggling for humanity against Adonay, the God of darkness and evil." - A.C. De La Rive, La Femme et l'enfant dans la Franc-Maconnerie Universelle, p. 588; Lady Queenborough, Occult Theocracy pp. 220-221. I really can't see any constructive purpose in repeating blatant disinformation regarding well-known symbols of which anyone can research the true history and provenance. Anything and everything can be twisted and hyped to sell books or promote an agenda — it still doesn't make it so. Of course there's nothing wrong with speculating about the possible motives and actions of the Pigs In Charge, but it needs to at least be based on accurate knowledge and verifiable evidence. The focus of this forum is to investigate and examine the sources of propagated information to determine the purpose, motive and credibility of its content and promoters. When the content is full of historical inaccuracies, sensational distortions and misinformation, the intent becomes clear. We are not here to diffuse agenda-driven disinformation or superstitions based on the dubious hearsay of a few odd characters' perceptions and subjective opinions. P.S. I have already explained before here how the misuse of quotes out of context to fit an agenda become tools of disinformation when propagated without examination, e.g. the "secret societies" reference extracted from a JFK speech. In this story we learn that the European Space Agency prioritized operating of Envisat satellite until the last drop of fuel rather than preserving the safety of the satellite orbiting area, http://www.msnbc.msn.com/id/49332445/ns/technology_and_science-space/. It would have taken just 60 kilograms of fuel to lower Envisat’s orbit by 30 kilometers, to 750 kilometers where natural forces would have pulled the satellite back to earth. How irresponsible! But if there are few or no satellites really up there then maybe its not such a big a problem. It makes for a good story, drama and all. We also get to see what its like when supposedly one satellite takes the picture of another. Not sure what I was expecting, maybe a better quality picture or maybe much worse. Parts of the gold colored solar panels are clear focus and the rest are blurry. Hard to imagine how that was possible. "On April 15, the French space agency CNES rotated the Pleiades Earth observation satellite to capture this image of Envisat. 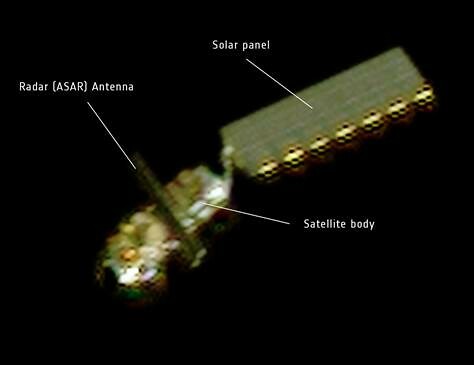 At a distance of about 100 km, Envisat’s main body, solar panel and radar antenna were visible." Just some food for thought on this topic. Most of you have already discovered the “Artists rendition” disease within NASA, where NOTHING is shown to us in authentic form; rather we always get some clown drawing with no explanation as to why. I recently read an article on space.com after searching for “space debris” and the result was an article with about 12 pages of claimed imagery for “space debris”. About 80-90% of the images were artists’ renditions the rest was the nonsense uncovered here like huge acorn looking metal clunkers sitting on a beach front, but actual debris like fragments? I do believe there is not one shred of real evidence for fragmented debris, only drawings and innuendos. Furthermore, a rhetorical question I would like to pose… With hundreds to thousands of hours of “space” footage of the earth from the viewpoints of “shuttles, satellites, and the ISS”, how come there has NEVER, not once ever, since the early 1980’s, have those hundreds to thousands of hours of video sequences ever caught just one satellite whizzing by, or one shred of space debris. This is a major contradiction and proof of fakery. The MSM will vomit articles about a debris ring encompassing the earth from all the failed hardware, will attach the “artists rendition” to the article of the view from space, will spread engineered fear about the dangers of this debris field, yet the “live” videos from space show the planet clear as day with not one object in the field of view, ever (of course including stars as well). I postulate this is evidence of 4 major things both directly and indirectly: one the satellite fraud; two the space debris fraud; three the shuttle/ISS fraud; and finally the view from space fraud. Nasaspotlight wrote: With hundreds to thousands of hours of “space” footage of the earth from the viewpoints of “shuttles, satellites, and the ISS”, how come there has NEVER, not once ever, since the early 1980’s, have those hundreds to thousands of hours of video sequences ever caught just one satellite whizzing by, or one shred of space debris. ... yet we never see these things in photos or videos taken "from space." And, I would think at least some of it should be visible from the surface when illuminated at the correct angle by the sun. Nasaspotlight wrote: About 80-90% of the images were artists’ renditions the rest was the nonsense uncovered here like huge acorn looking metal clunkers sitting on a beach front, but actual debris like fragments? LOL, that’s the one. I think this is direct proof of a lie. Either that debris field (and satellites for that matter) doesn’t exist or the video footage from space is a fraud (of course both the space debris/satellites and the video footage are likely frauds). They can’t have it both ways. NASA says an object called Comet Ison 13 will soon pass close to Earth, “graze” the Sun and “slingshot” back out into space in the November-December-January time frame. They say it will, at the very least, create a meteor shower which will cross Earth's path. They also say they're not sure exactly what will happen to the comet as it “grazes” the Sun and is subjected to its heat and gravitational forces. Oddly, the idea that such an object (if it really existed) could break up into a number of pieces, each with unpredicted paths, isn't mentioned despite such a thing supposedly happening with the Comet Shoemaker–Levy 9 back in 1994. This would seem an obvious possibility (within the fake NASA context of it all) yet they don't seem to have considered this outcome for some reason. I'm wondering: Will this Comet Ison 13 “event” turn into something "calamitous"? Something along the lines of the Earth-collision scenarios that Hollywood and the media have been prepping us for with countless disaster scenarios for decades? It even has the magic number 13 associated with it! The timing would be perfect for such a psyop – November 28 (Thanksgiving in the USA) is the date of Ison's closest pass by the Sun and Dec 26th (day after you-know-what) is the comet's closest approach to Earth. The November-December period is probably America's most emotionally vulnerable time of year due to the programmed sentimentality of “the holidays” and last December we had the Sandy Hoax psy-op which attempted to take advantage of this. Anyway, I admit this is pure conjecture on my part but I just couldn't resist. Actually any comet elliptically orbiting our Sun and passing close to it, e.g., every 10 million years cannot shed anything because everything of the comet is subject to Sun's gravity and the mass/momentum of the comet. The total mass of the comet will just heat up when approaching and cool down when leaving the Sun. Every atom of the comet will just continue to orbit the Sun as it has done for millions of years. Only temperature increases when slingshoting around the Sun. Any water, actually ice, of the comet will evidently become vapour for a while and return to being ice of the comet after the slingshot. It may show up like a nice comet tail for us observers on Earth BUT after passage the tail returns to the comet again. A comet cannot shed anything, i.e. nothing can fall off a comet in motion, unless it collides with something but the probability for that is 0. Or close to. NASA does not know anything about these matters as their only purpose is to steal money from US tax payers. Heiwa wrote: NASA does not know anything about these matters as their only purpose is to steal money from US tax payers. But of course, ESA and its European ARIANE program does nothing of the sort! They seriously place satellites in space for us to play with!